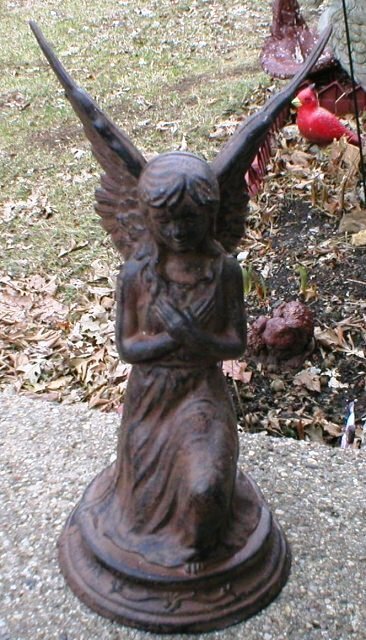 A cast iron angel can add a little touch of art to a garden, but make sure to pay careful attention to the accumulation of surface dirt, grime, lichen, algae or mold. 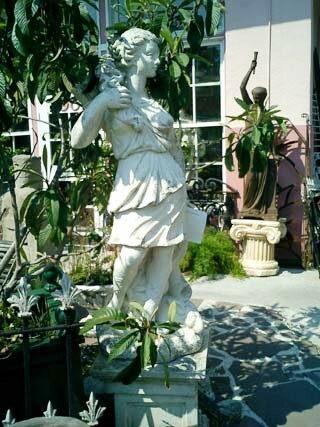 People love their gardens, and that includes many wonderful old statues and other ornaments made of stone and metal. But every winter, many witness damage to some of them from exposure to the elements. So what should you do now—or this fall at the latest—to protect stone and metal yard art from extreme winter conditions? It’s good to be thinking about protecting your outdoor art now, before the leaves begin to fall and temperatures drop. Most of us assume that garden ornaments, outdoor statuary and fixtures made of stone or metal that were designed to be displayed and used out-of-doors will survive seasonal changes indefinitely without damage or deterioration. While some weathering is expected, surface deterioration occurs slowly and is frequently unnoticed until after much of the damage has already been done. Deposits of dust from circulating air supports the formation of fungal cells on porous stone, metal and clay sculpture. Once begun, the roots (mycelium) of such growth break through the surface and begin a cycle of deterioration that, if left untreated, can be permanent and irreversible. Winter weather can play havoc on your outdoor statuary. 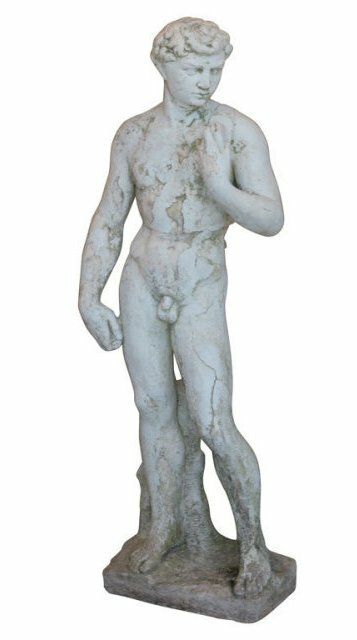 This 19th-century plaster cast of a copy of the statue of David is showing signs of weathering. Now, before the leaves start falling, is the time to prepare your outdoor art for the winter. Perhaps the number-one enemy of all stone, metal and wood garden pieces is water and ice. Freeze-and-thaw cycles that occur during the winter can further exaggerate these effects on nearly all types of outdoor art and statuary. Small cracks will quickly grow if left unrepaired throughout the winter, as water freezes and expands, forcing the crack to split apart further. Outdoor statues made of cast zinc are far more brittle than those made in bronze. Close examination of zinc sculpture usually shows that some seams have separated, probably because there were incipient cracks to begin with. Lead-tin solder seams are often found cracked on statues that appear intact, and white-bronze joins tend to separate over time because they were often poorly bonded in the first place. Significant to keeping outdoor sculpture and statuary in good condition, is carefully selecting an appropriate location. Organic growth on statuary will be greater when dense trees, shrubs and ground cover are nearby and become overgrown. Outdoor statuary of marble or bronze can be adversely affected when placed near a swimming pool or fountain, where chlorine can cause premature corrosion. A 19th-century cast stone statue of Diana the huntress, virgin goddess of the hunt, atop a cast stone pedestal. While statuary can add to the beauty of your garden for most of the year, outdoor art should be brought inside during winter months if possible. Year-round routine maintenance can help to preserve outdoor sculpture for a long time. Examination by an experienced conservator is a critical first step. A professional assessment will alert you to existing conditions such as oxidization, deterioration and stress fractures that may not be clearly visible. A conservator may suggest and prioritize necessary treatment options that can include simple cleaning, stabilization and restoration of damaged areas. Part of any suggested treatment should be a plan for regular maintenance and future restorations that may be necessary. For example, the conservation treatment of a bronze statue will frequently include the application of hot and cold wax layers. Every few years, the base wax will need to be rejuvenated. The paste wax is typically reapplied a few times a year to seal and protect the sculpture. 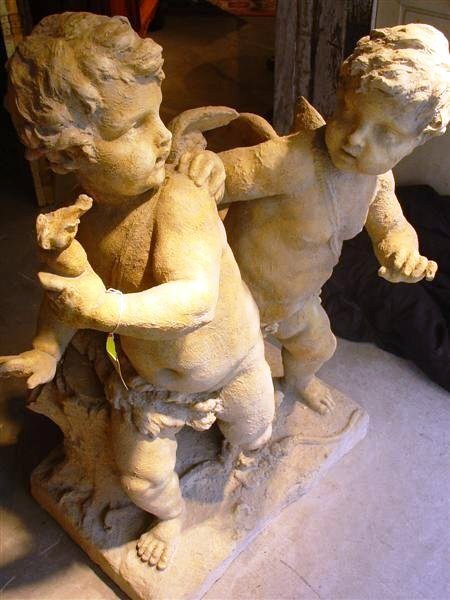 These stone cherubs from France were salvaged from a building pediment. Freeze-and-thaw cycles that occur during the winter can damage nearly all types of outdoor art and statuary. It is important to carefully inspect all of your outdoor art several times a year. Pay careful attention to the accumulation of surface dirt, grime, lichen, algae or mold. If a statue or garden ornament has been repaired or restored, examine these areas for any signs of deterioration, cracking or other damage. Small structural cracks and voids can be in-filled with proper materials and sealed to minimize the need for costly restorations in the future. Keep in mind, that cleaning, stabilization, restoration and conservation treatments can only be performed on large outdoor works during warm weather, unless of course, they can be moved indoors for treatment. Now is certainly the best time to take necessary steps to prevent or minimize the effects of winter. • Move outdoor art inside during winter months if possible. Douglas Eisele is with Eisele Gallery of Fine Art and Old World Restorations, Inc.